Badger series of garbage disposals is undoubtedly one of the economical and reliable like of products by InSinkErator. Badger 5 is one among the popular disposals, and there are two more models Badger 5XP and Badger 500. Badger 5 Vs Badger 500; what’s the difference? Yes, you heard it right, there is no difference between Badger 5 & Badger 500, both are absolutely the same, except maybe Badger 500 is pricier by a few dollars. There is absolutely no difference between these disposals in anything, Badger 500 is the Homedepot version of Badger 5. Then why is it costly? Marketing gimmick. Badger5 & 5XP models of disposals are mostly similar to each other though there are a few differences. Let’s first see how they are similar. Badger 5 and Badger 5XP both follow the exact same design, both have the same chamber capacity of 26oz, and both are very similar to Badger 1 (you can check my previous article Badger 1 vs Badger 5) They are continuous feed type disposals where you can add food wastes continuously to the grinding chamber. Both Badger disposals run on Dura-drive induction motors at 1725 RPM. Both can be easily replaced with each other. They have grinding components made of galvanised steel, both come with the same set of accessories and are budget-friendly. There are two notable differences between Badger 5 and Badger 5XP disposals. The main one is power. Badger 5 disposal runs on a 1/2 HP motor whereas Badger 5XP is much more powerful with a 3/4 HP motor. The other is the warranty. Badger 5 comes with 2-year limited warranty whereas the other has a 3-year limited warranty. Other not so noticeable differences include overall height and weight where Badger 5XP exceeds its friend by a small margin. Definitely, you can. Both use the same EZ mounting system, all you have to do is twist and disconnect one and twist and connect the other. Which should you buy; Badger 5 or Badger 5XP? The answer depends totally on you. I would choose Badger5XP had the price difference between them were negligible but its sometime around 30 bucks. So if you want a disposal with more power, go for 5XP else go for Badger 5. 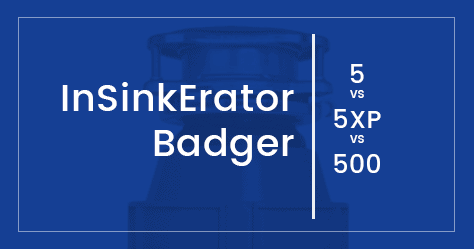 InSinkErator Badger 5 Vs Badger 1 – What is the difference? InSinkErator Badger 1 vs Badger 100 – What’s the difference?